David Warner laughed of talk of a feud between him and Steve Smith after the suspended pair went head to head in a grade cricket match in Sydney on Saturday. The duo are serving year-long suspensions from international and state cricket imposed by Cricket Australia for their roles in the ball-tampering scandal at Newlands in March. Smith took a wicket and a catch in the field for Sutherland at Coogee Oval while narrowly missing out on a fifty with the bat, while Randwick-Petersham opener Warner was dismissed for just 13 in the first innings of the 50-over match by Austin Waugh – son of former Australia Test star Steve Waugh. 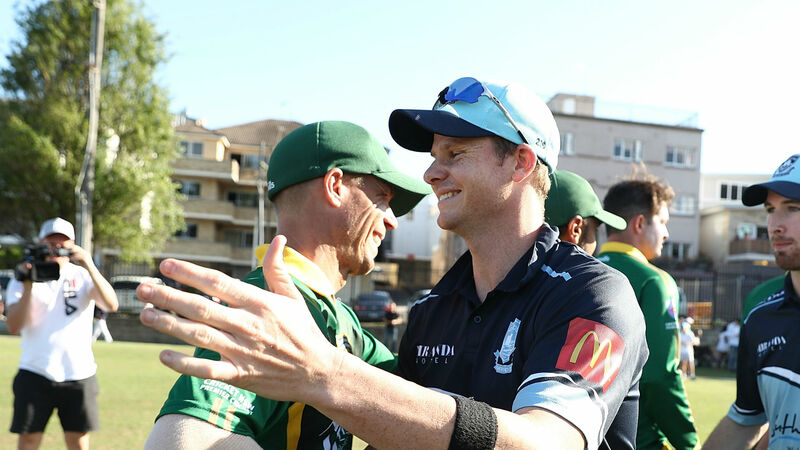 Warner and Smith shared a handshake and an embrace at the end of Sutherland's three-wicket victory, which was watched by a reported 2,000 spectators. "There has been a lot of media talk that we don't get along, that I've thrown him under the bus," said Warner. "It's good comedy for us, we enjoy it. We just sit back and laugh. We're catching up with each other and texting each other. "We don't read it all but some of the fun stuff the boys throw towards us, we just laugh at it." The Australian Cricketers' Association has called for the suspensions imposed on Warner and Smith, as well as the nine-month ban Cameron Bancroft received for his part in the controversy against South Africa, to be lifted. Warner is not anticipating that to occur but hopes to return to the fold in time to earn a place at next year's ICC Cricket World Cup. "At the end of the day I'm sitting here 12 months on the sidelines, that's my take on it," he said. "The end result and the long-form goal is to get back in the Baggy Green and play the World Cup. But it's a game at a time." Former Australia international Shane Watson plundered 63 off 41 balls for Sutherland, while Englishman Daniel Bell-Drummond scored a brilliant 106.